Rapid spurious identification, low phase noise, extensive pulse analysis functions and wide analysis bandwidth make the R&S®FSW signal and spectrum analyzer an essential tool in the development and production of radar systems. 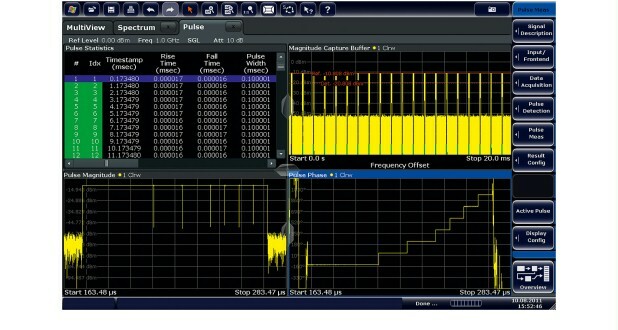 Characterizing radar systems requires numerous pulse parameters to be measured. The R&S®FSW-K6 option measures – at the touch of a key – all relevant parameters such as pulse duration, pulse period, pulse rise and fall times, power drop across a pulse, and intrapulse phase modulation, and produces a trend analysis over many pulses. The user selects the results to be displayed simultaneously on the screen. The R&S®FSW thus delivers a full picture of a radar system within seconds.